In New Zealand fishing with snapper longlines allows the boatie to fish, dive, water ski or just go beach combing and still get a catch of snapper for friends and family. Often a Boat Longline will catch good snapper when the fishing is really hard and rods and handlines fail. One of the keys to success with a Boat Longline is to use good quality, firm baits. 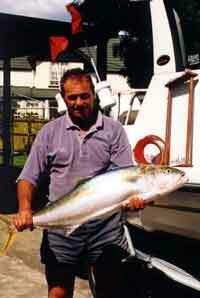 Fresh caught kahawai, trevally or any kind of mackeral are premium for bait. Frozen mullet, trevally and squid are also good longline baits when fresh bait is unavailable. Interestingly, Paul Barnes of Paul's Fishing Kites used squid bait for the latest 15,000 hook trial and averaged around one snapper for every three hooks set on the Target Snapper Hooks. One of the great things about running a 25 hook Boat Longline is that you never quite know what you are going to catch. 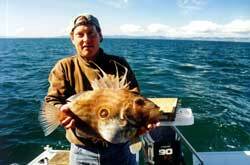 Paul Major took this huge john dory off Waiheke Island on one of our Boat Longlines. The bulge in it's stomach is a legal size snapper which the john dory had swallowed whole. Two completely separate 25 Hook Boat Longlines stored neatly on one reel. Current fishing regulations allow a maximum of two longlines per boat with no more than 25 hooks per longline. This rig allows you to set the maximum number of hooks. An extremely popular system with charter boat skippers who use these longlines to guarantee their clients a good catch of fish. Our most popular boat longline fishing rig for snapper . 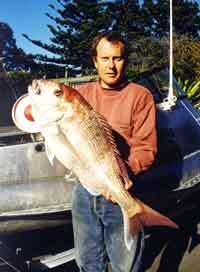 Catch more big snapper, reduce your catch of undersized snapper and reduce gut hooking of snapper to less than 1%. This is a compact longline fishing system and is very easy to use single handed.